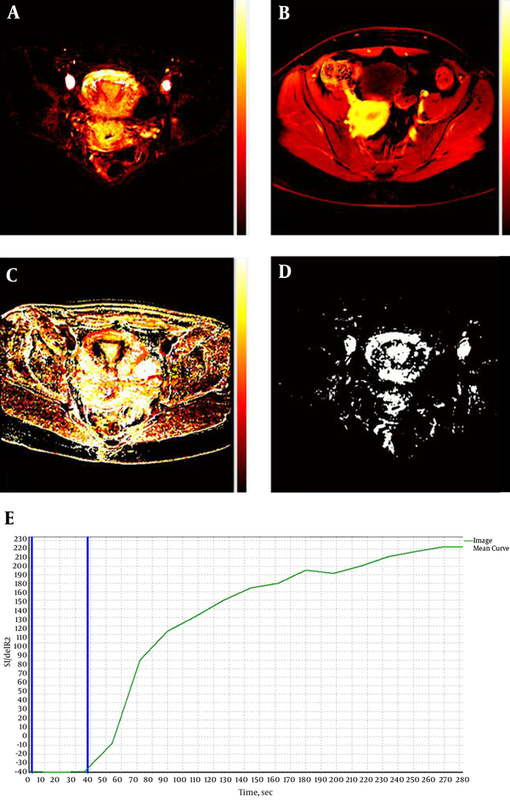 To Cite: Majd S, Johan Jeet Abdullah B, Ahmad Sarji S, Hong Yeong C, Azmi Mat Adenan N. Quantitative Dynamic Contrast-Enhanced Magnetic Resonance Imaging in Symptomatic Uterine Fibroids and Normal Uterus: A Feasibility Study, Iran J Radiol. 2017 ; 14(2):e36213. doi: 10.5812/iranjradiol.36213. Background: Dynamic contrast enhanced-magnetic resonance imaging (DCE-MRI) is a relatively new imaging technique that provides additional information on vascularity and permeability of the uterine tissues to improve decision making in patient management. Objectives: The purpose of this study was to obtain the quantitative DCE-MRI parameters of symptomatic uterine fibroids and compare to the parameters obtained from normal myometrium, endometrium, and cervix. Patients and Methods: Nineteen patients (aged 40 ± 5 years) with the clinical diagnosis of uterine fibroids were recruited. After routine MRI pelvis scan, DCE-MRI was performed using T1 volumetric liver acquisition with volume acceleration (LAVA) sequence. The data were post-processed using an independent DCE-MRI analysis software. ROI was drawn on the fibroid and the quantitative DCE-MRI parameters i.e. Ktrans (volume transfer between the blood plasma and extracellular fluid), Kep [flux rate constant between the extracellular extravascular space (EES) and blood plasma], Ve (EES fractional volume), and semi-quantitative parameters i.e. TTP (time to peak), and IAUGC (initial area under the gadolinium concentration-time curve) were determined. The patients then underwent hysterectomy and uterine fibroids were confirmed in all the patients by histopathology results. 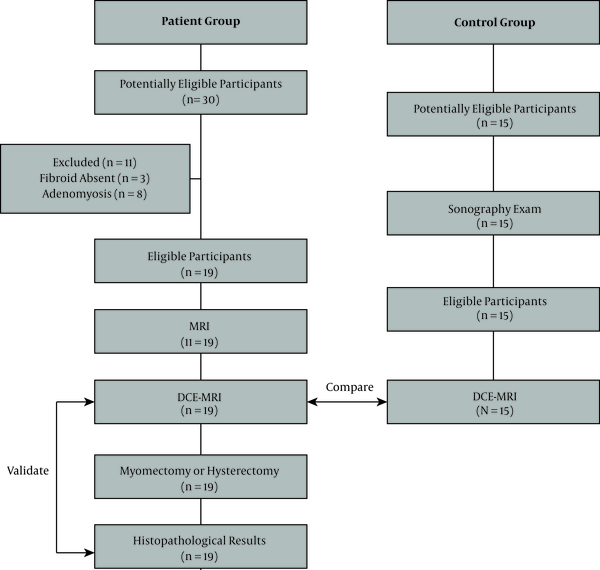 In the control group, fifteen healthy volunteers (aged 32 ± 6 years) who did not have uterine fibroid confirmed by sonography examination were recruited. The volunteers underwent the same DCE-MRI scan as the patients and the quantitative DCE-MRI parameters of the normal myometrium, endometrium and cervix were obtained. The DCE-MRI parameters from these two groups were then compared. Results: The median Ktrans in the myometrium, endometrium and cervix of the healthy volunteers were 0.26 ± 0.13, 0.20 ± 0.15, and 0.30 ± 0.13 min-1, respectively. No statistical significant difference was found in all the DCE-MRI parameters between the myometrium, endometrium and cervix of the healthy volunteers. The median Ktrans in fibroids was 0.50 ± 0.25 min-1. There were statistically significant differences (P < 0.05) found in Ktrans and Ve between the normal myometrium and fibroid tissue. Conclusions: The Ktrans and Ve of fibroid tissue were statistically significantly higher than those obtained from the normal myometrium, whereby the suggested cut-off values were 0.47 min-1 (sensitivity 64.7%, specificity 92.3%) and 0.62 (sensitivity 70.6%, specificity 78.6%), respectively. Quantitative DCE-MRI findings from this study may provide a foundation for assessment of other uterine pathologies. Quantitative dynamic contrast-enhanced magnetic resonance imaging (DCE-MRI) is a gadolinium diethylenetriamine penta-acetic acid (Gd-DTPA) contrast enhanced imaging technique to assess the permeability and vascularity of tissues (1). The enhancement pattern in DCE-MRI also reflects intratumoral angiogenic activity. In oncology, it is an instrumental tool for treatment planning as it provides physiologic information on the tumor in addition to anatomic detail (2). High sensitivity (> 90%) and moderate specificity (> 65%) have been reported in breast cancer imaging using this technique (3-7). These dynamic MR sequences can be easily incorporated with minimal resource implications i.e. adding less than 10 minutes to the total scanning time. Further, since it does not utilize ionizing radiation, it is an ideal tool for repeat imaging studies in assessing responses to therapy. Uterine fibroids are the most common benign tumors of the female reproductive system. They originate from the smooth muscle wall of the uterus and usually occur in clusters. There are three different types of fibroids based on their anatomical location, i.e. intramural, subserosal, and submucosal fibroids (8). Due to the possibility of severe symptoms such as menorrhagia/hyper-menorrhea and the impact on fertility, it is very important to accurately diagnose and identify the best treatment for uterine fibroids (9). MRI with its superior soft tissue differentiation capabilities gives exquisite information of uterine anatomy; therefore, malignant change may be detected. DCE-MRI provides additional information on vascularity and permeability of the uterine tissues that can aid in decision making for the best treatment option (10). This technique may also potentially be used to evaluate newer drug therapies for uterine fibroids, adenomyosis or uterine sarcoma. The DCE-MRI protocol generally involves three-step acquisition. First, initial images are acquired to localize the tumor and provide anatomical information. Second, imaging sequences that allow calculation of baseline tissue T1-values before contrast agent administration are acquired to enable subsequent analysis. Third, dynamic data are acquired every few seconds in T1-weighted (T1W) images over a period of 5 to 10 minutes (11). DCE-MRI images can be analyzed in quantitative (model-based) and semi-quantitative (non-model based) approaches. The quantitative parameters include the volume transfer coefficient of contrast between blood plasma and extracellular extravascular space (EES) (Ktrans), rate constant (Kep) and the size of the EES (Ve); whereas, semi-quantitative parameters include initial area under the gadolinium concentration-time curve (IAUGC) and time-to-peak (TTP). Non-model based parameters (IAUGC and TTP) are easy to calculate however they have a complicated and incompletely defined relationship with underlying tumor physiology. On the other hand, model-based parameters (e.g. Ktrans, Kep, Ve) are in theory more “physiologically meaningful” and are independent of acquisition protocol and solely reflect tissue characteristics (12). There were three objectives of this study: 1) to acquire the quantitative and semi-quantitative pharmacokinetic parameters of the myometrium, endometrium, and cervix from the DCE-MRI of the healthy volunteers; 2) to compare the pharmacokinetic parameters of uterine fibroids with normal myometrium and; 3) to determine the cut-off values for DCE-MRI parameters to differentiate between fibroids and normal myometrium. This study was evaluated and approved by the medical ethics committee of the University of Malaya Medical Centre, Kuala Lumpur, Malaysia. Written informed consents were obtained from all the recruited subjects. This prospective study involved two subject groups: healthy volunteers (control) and uterine fibroid patients confirmed with clinical and sonographic diagnosis. Prior to the study, the principle investigator conducted a short interview and briefing with the patients. Patient demography (i.e. age, last menstrual period, gravity and pariety) and medical history were documented. The healthy volunteer subjects were recruited from 15 women who had regular menstruations and a normal or healthy uterus on sonography. Both groups underwent the same DCE-MRI pelvic scan. Myomectomy or hysterectomy was performed for all the patients after the MRI examination and the diagnosis of uterine fibroid was confirmed by histopathological results. The flow of participants through the study is presented in Figure 1. A 1.5 Tesla MRI system (Signa HDxt 1.5T, General Electric Healthcare, Milwaukee, USA) was used in this study. Routine pelvic MRI was done for patients with fibroids using T1-weighted (T1W), T2-weighted (T2W) and short T1 inversion recovery (STIR) sequences with 4°, 8° and 12° flip angles. DCE-MRI was done in both groups whereby dynamic sequences were acquired in axial planes using liver acquisition with volume acceleration (LAVA) sequence with high temporal resolution. Approximately 15 mL of Gd-DTPA contrast (Magnevist 0.5 mmol/mL, Bayer Healthcare Pharmaceuticals Inc., Germany) was injected at a rate of 4 mL/s through a pump injector (Tyco, Mansfield, USA) followed by a 20 mL saline flush. Dynamic images were acquired at approximately 37 seconds following contrast injection for 20 consecutive time points with a total acquisition time of 470 seconds. The images were analyzed using an independent DCE-MRI software (Nordic ICE, Nordic Neuro Lab, Bergen, Norway). First, T1 relaxation times for the myometrium, endometrium and cervix were referred from the user’s manual provided by General Electric Healthcare, USA. The T1 relaxation time for fibroid is currently unavailable; therefore, the T1 relaxation time for fibroid was measured using MATLAB version R2014b software (MathWorks, Massachusetts, USA). The T1 relaxation times for different tissues are shown in Table 1.
aT1 relaxation time was obtained from the user’s manual of General Electric Healthcare. Subsequently, the pharmacokinetic parameters i.e. Ktrans, Kep, Ve, IAUGC and TTP were obtained by using DCE-MRI software. The descriptions of these parameters are summarized in Table 2. Images of DCE-MRI acquired at 120 flip angle were uploaded to the software and analyzed using a two compartmental pharmacokinetic model (Tofts model), which is also known as the general kinetic model. A 0.12 cm fixed region of interest (ROI) was placed at the myometrium, endometrium and cervix for the control group, and fibroid for the patient group. The T1 relaxation time for each tissue was manually put into the software (Table 1). The time-intensity curves for the respective tissues were then plotted and displayed by the software. In addition, the arterial input function (AIF) was obtained using auto-detector mode to calculate the contrast concentration in the plasma (Figure 2). The parameters were addressed both qualitatively and quantitatively using this software. The measurements for Ktrans, Kep, Ve, IAUGC and TTP were repeated twice in this study. Ktrans, min-1 Volume transfer constant for the transfer of contrast agent from the blood vessel into the extracellular extravascular space (EES). It reflects contrast delivery (perfusion) and transport across the vascular endothelium (permeability). Figure 2. A, Example of an axial T1-weighted image of the pelvis with region of interest (yellow box) drawn over the uterus for quantitative dynamic contrast-enhanced magnetic resonance imaging (DCE-MRI) analysis. B, Mean signal intensity curve (green) and arterial input function (AIF) (red) for the selected tissues. All the statistical analysis performed in this study was done using SPSS version 20.0 software (IBM Corporation, New York, USA). First, the normality of data was assessed using Shapiro-Wilk test and intraobserver variability was evaluated using intraclass correlation coefficient (ICC). The mean or median values of Ktrans, Kep, Ve, IAUGC and TTP of the myometrium, endometrium and cervix were obtained and compared between the anatomical groups using Wilcoxon signed rank test. 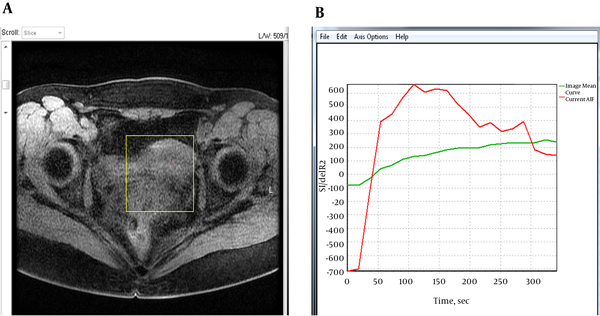 DCE-MRI parameters were then compared between the normal uterus (myometrium) and fibroids using Mann-Whitney U test. A confidence interval (CI) of 95% was used in all statistical tests. DCE-MRI parameters of the normal uterus during different menstrual cycles, i.e. follicular and luteal phases were also compared. Furthermore, the receiver operating characteristic (ROC) analysis was performed to find the representative cut-off values to differentiate uterine fibroids from normal myometrium. Nineteen pre-menopausal patients (aged 40 ± 5 years) with the clinical diagnosis of uterine fibroids detected by ultrasound were enrolled into the study. All the cases were symptomatic. The symptoms included dysmenorrhea, hypermenorrhea and menorrhagia. No medical or interventional treatment was done on any of the patients prior to the MRI study. All the patients underwent MRI of the pelvis with the routine protocol, followed by an additional DCE-MRI scan. Either hysterectomy or myomectomy was planned for the patients based on the MRI findings. The histopathological results confirmed intramural uterine fibroids in all the patients. No complication was encountered in any of the patients during and after the examination. The control group consisted of 15 pre-menopausal women (aged 32 ± 6 years) who did not have uterine fibroid confirmed by sonography. All the volunteers completed DCE-MRI of the uterus without going through the routine pelvic MRI. No complication was encountered in any of the volunteers after the study. The normal uterine anatomy was best seen on T2W images where high signal intensity was observed at the endometrial canal, low signal intensity was observed at the junctional zone or inner myometrium, and intermediate signal intensity was observed at the outer myometrium. The intensity gradually enhanced on dynamic phases and the intensity at the myometrium region enhanced homogeneously. No focal enhancing lesion was observed in the control group. Figure 3A - D show examples of semi-quantitative maps of a normal uterus, while Figure 3E shows the dynamic time-intensity curve of the normal uterus. The curve has a baseline that indicates bolus arrival time followed by a gradual gradient of contrast enhancement, which was found consistent in normal tissue. The DCE parameters (median ± standard deviation) that were then acquired from the semi-quantitative maps are presented in Table 3. The data were not normally distributed hence non-parametric analysis was used in statistical analysis. High degrees of reliability were found for intraobserver measurements (ICC = 0.757, 0.980, 0.990, 0.750, and 0.767 for Ktrans, Kep, Ve, IAUGC, and TTP, respectively). DCE parameters in the myometrium, endometrium and cervix were not statistically significant different (P > 0.05) in the control group. In addition, there was no statistically significant difference (P > 0.05) between DCE parameters during follicular and luteal phases except for Kep in the cervix (P = 0.042). There was also no statistically significant difference (P > 0.05) between parity and all DCE parameters in the normal uterus. Figure 3. A-D, Semi-quantitative maps of a normal uterus acquired using the dynamic contrast enhanced magnetic resonance imaging (DCE-MRI) software. A, Ktrans; B, initial area under the gadolinium concentration time curve (IAUGC); C, time-to-peak (TTP); D, Ve. ; E, Time-intensity curve of the normal uterus. The two blue lines indicate bolus arrival time (~37 seconds). aP < 0.05 shows a statistically significant difference. The dynamic time-intensity curve of a uterine fibroid is shown in Figure 4. Similar to the normal uterus, the graph has a baseline followed by a gradual increment gradient corresponds to a benign lesion. The DCE-MRI parameters of the uterine fibroids are presented in Table 3. Two categories of signal intensity were observed in the fibroids on T2W images where 42% of the fibroids demonstrated low signal intensity (classified as hypo-intense or “black” fibroids) and 58% of the fibroids demonstrated high signal intensity (classified as hyper-intense or “white” fibroids) (Figure 4). Some of these fibroids showed discernible signal intensity changes on T2W, diffusion-weighted and T1W post-contrast images due to necrosis and degeneration. However, none of the fibroids showed delayed enhancement and no statistically significant difference (P > 0.05) was found on the DCE-MRI parameters between black and white fibroids. Figure 4. A and B, Time-intensity curve of an intramural uterine fibroid. The thick arrow points to the artery where arterial input function (AIF) was obtained and the thin arrow shows the region of interest (ROI) of the fibroid. Ktrans map of a patient with hyperintense (white) fibroid. In comparison of DCE-MRI parameters between normal the myometrium and fibroids, statistically significant differences were found on Ktrans and Ve (P = 0.014 and P = 0.032, respectively), however no statistically significant difference (P > 0.05) was found on other parameters (Table 3). Therefore, Ktrans and Ve were used in ROC analysis to determine the cut-off values for uterine fibroids. The sensitivities and specificities of different cut-off values are summarized in Table 4. In this study, both sensitivity and specificity were important, hence the cut-off value of ktrans was determined at the highest sensitivity (64.7%) and specificity (92.3%), which was measured at 0.47 min-1 (area under the curve (AUC) = 0.762, 95% CI: 0.589 - 0.935, P = 0.015). Using the similar method, the cut-off value of Ve was determined at 0.62 which gave sensitivity and specificity of 70.6% and 78.6%, respectively (AUC = 0.708, 95% CI: 0.515 - 0.901, P = 0.060). a95% confidence interval is used. The advanced MRI techniques, such as DCE-MRI, raise the hope of providing more functional information about the diseases (13). DCE-MRI can measure angiogenesis non-invasively, and is rapidly becoming the standard method for assessing vascular properties of the lesions. For oncology assessments, this imaging technique provides additional information on the efficacy of angiogenesis inhibitors to augment evaluations based on tumor size criteria determined by the world health organization (WHO) and response evaluation criteria in solid tumors (RECIST). The ability to analyze DCE-MRI images and accurately assess the vascular properties of the lesions provides a useful biomarker to determine a number of treatment factors. These include drug efficacy, response after chemo- or radiation therapy, non-invasive distinction between benign and malignant pathology or grading of tumors, and a tool to guide lesion biopsy. DCE-MRI provides a functional approach in characterizing microvasculature, specifically perfusion and permeability of blood vessels and the volume of extracellular space (14). Abnormal microvessels in DCE-MRI may indicate hypoxia of the tissues. This is because tumor angiogenesis is associated with vessel formation and non-competent arteriovenous shunts, which lead to less effective perfusion and a more hypoxic environment than in normal tissues (15). Detecting hypoxic tumors allows hypoxia-modifying therapy or even primary surgery (16, 17). A study by Newbold et al. (18) demonstrated statistically significant correlation between various DCE-MRI parameters, particularly Ktrans (that shows permeability of blood vessels) and pimonidazole staining (an exogenous marker for hypoxia). The appearance of tumor in DCE-MRI has been used to successfully predict the treatment response to chemo or radiation therapy in tumors. However, quantitative DCE-MRI parameters and differences between normal uterus and abnormal myometrium with respect to the reproducibility of DCE-MRI parameters have not been previously reported to our knowledge. This study showed that all the quantitative and semi-quantitative pharmacokinetic values in uterine fibroids except TTP were higher compared to the normal myometrium. However, statistically significant differences (P < 0.05) were only seen in Ktrans and Ve. This indicated that permeability of fibroid lesions is higher than the normal tissue. The cut-off values for ktrans and Ve were suggested to be 0.47 min-1 and 0.62, respectively wherein beyond these values the uterine tissue is suspected abnormal. However, these values cannot be used to differentiate between benign and malignant masses as there was no malignant case included in this study. Further research with larger sample sizes including malignant tumors may help to differentiate benign from malignant conditions. Among the two different types of fibroids, i.e. “black” (low signal intensity on T2W) and “white” (high signal intensity on T2W) fibroids there was no statistically significant difference (P > 0.05) found on the DCE-MRI parameters between the two groups. Nevertheless, it was observed that many non-enhancing pixels were detected on the black fibroids during quantitative analysis. Previous studies have suggested that fibroids that are homogeneous and hypo-intense on T2W images seem to respond better to MR-guided focused ultrasound (MRgFUS) therapy than fibroids that are heterogeneous and hyper-intense (19, 20). Further, Kim et al. (21) concluded that a higher Ktrans value at baseline DCE-MRI suggested a poor ablation efficacy of MRgFUS for symptomatic uterine fibroids. Therefore, the pre-treatment DCE-MRI used in conjunction with T2W imaging may improve the criteria for selecting uterine fibroids amenable to Magnetic Resonance Guided Focused Ultrasound Surgery (MRgFUS) treatment, potentially leading to improved patient outcomes (22). There was no statistically significant difference noted on any of the DCE-MRI parameters between different phases of menstruation (follicular and luteal phases) in the normal myometrium. Therefore, we can conclude that different phases of menstruation would not affect DCE characteristics of the tissues in DCE-MRI of the uterus. There was also no strong correlation found between DCE-MRI parameters with parity factor. 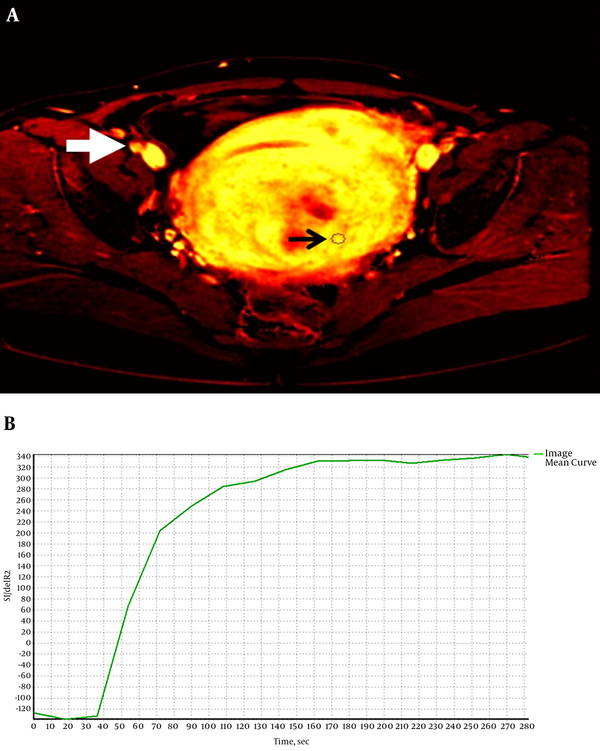 Another proven contribution of DCE-MRI in pelvic imaging is its ability in distinguishing between ovarian fibroma and subserous uterine leiomyoma, which sometimes can be difficult to determine using ultrasound and computed tomography. A study carried out by Isabelle Thomassin-Naggara et al. (23) showed that DCE enhancement in uterine leiomyomas was more intense and precocious than in ovarian fibromas. Hence, the method can be used if sonography fails to show the origin of the pelvic mass. In conclusion, uterine fibroids had significantly higher values of Ktrans and Ve compared to normal myometrium indicating that fibroids had higher perfusion and permeability than the normal tissues. The cut-off values of Ktrans and Ve were determined at 0.47 min-1 (sensitivity 64.7%, specificity 92.3%) and 0.62 (sensitivity 70.6%, specificity 78.6%), respectively. As previously reported, the fibroids that had a higher Ktrans responded poorly to MRgFUS treatment compared to fibroids that had a lower ktrans (21). Therefore, DCE-MRI data can aid in decision making for the appropriate treatment for uterine fibroid patients. The quantitative parameters obtained from our study may provide the foundation for interpretation of DCE-MRI parameters of the uterus; however, a larger sample size is needed to validate the results. The authors would like to thank all the patients and volunteers who participated in this study. Funding/Support: This study was supported in part by the University of Malaya Postgraduate Research Grant P0048/012B.